DEBORAH CROMBIE: Labor Day! That means the end of summer is upon us (or in Texas at least according to the calendar), and what I want to know is WHERE DID IT GO? To give myself a little credit, I have grilled quite a bit, and spent time in the garden and sitting on the deck, playing with the dogs. I've watched several summer rainstorms from the swings on the front porch. I've watched dragonflies and fireflies and hummingbirds, and yesterday saw Monarch butterflies for the first time on our Greg's Mist Flower in the front garden. I did make ice cream, but did not manage my once-or-twice-a-summer treat of a root beer float. 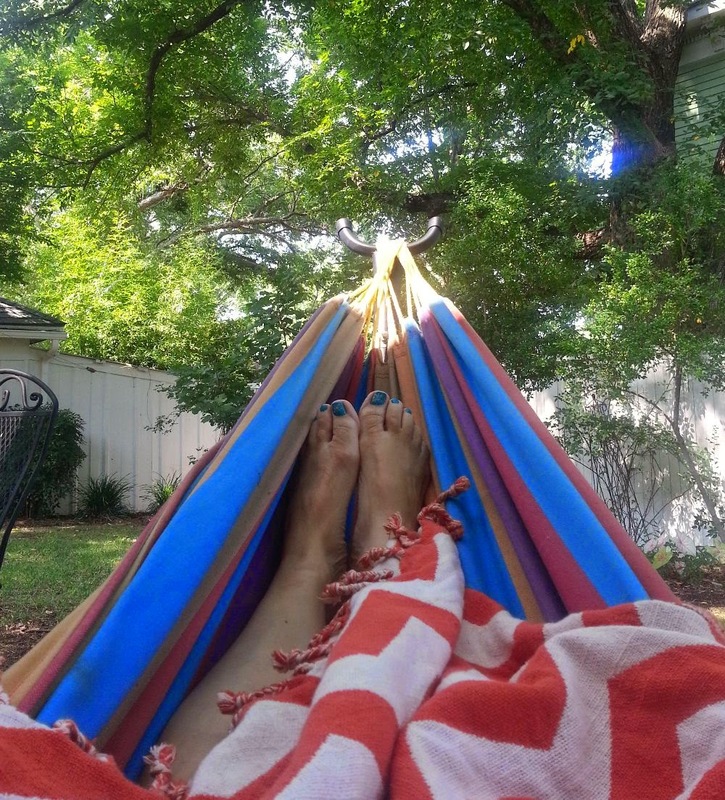 AND I have had exactly two Sunday mornings when the weather was cool enough to allow me to lie in the hammock and day dream for an hour or two, which for me is the absolutely perfect summer Sunday. REDS, what have YOU missed doing this summer? And can you squeeze it in at the last minute??? HALLIE EPHRON: Yes, the days do seem to speed past. I remember older folks saying that and I wondered what they were going on about. We have had a glorious summer here in New England, weather-wise. Sunny days and cool nights. We could use a bit of rain, but by now our lilacs are usually moldy from too much of it. We indulged root beer floats - my go-to dessert in summer, just a small one. And wonderful local tomatoes. All I grow that's edible in my garden in herbs, but it's been so nice to go out and clip some parsley, sage, oregano, and basil. I want your dad's Margarita recipe, Debs, pretty please?? It doesn't have to be summer for a margarita. RHYS BOWEN: Where did it go? Every year I make a vow to enjoy summer, slow down, take a picnic to a nearby beach or park and spend the afternoon with a book. And every year Labor Day comes and I realize I've been working every single day. Stupid! I suppose I do always have an end of summer deadline and a new book that comes out in August, and I was in Europe for six weeks in May and June so I can't complain. But I should enjoy simple summer pleasures, slow, lazy days. Actually my son got married in July and the house was full for a while and we did sit on the balcony talking, laughing and sipping wine until late at night, so that was perfect. And I have a post-summer treat coming up. We're going to a lovely bed and breakfast inn in Pacific Grove for my birthday. Right on the ocean, lovely grounds and Carmel nearby. I vow to sit, relax and do nothing for three days. DEBS: Wow, Rhys! Three whole days??? I suspect that will be a world record for you:-) Enjoy! JULIA SPENCER-FLEMING: This summer we didn't make it toOld Orchard Beach for glorious day of tacky pleasures on the sand and the boardwalk. However, if it's warm enough, we may go tomorrow! Thinking about it, most of what we didn't do this year is related to the weather; as Hallie says, it's been on the cooler side in New England (or, as I've read, we've just gotten used to unnaturally hot summers in the recent past) so the beach, hitting the midcoast or floating in the Saco River just haven't felt like pressing needs. We did get lots and lots done on the property, as I've told you about here. And we got to spend a lot of time, all five of us, as a family. I remain aware the time for that is slipping away faster than the end of summer, so I'm grateful for it. HANK PHILLIPPI RYAN: We have a swimming pool. I did not go in. Not once. And there you have it. We used to have wonderful times floating--we'd get blow-up rafts, and iced tea, and books, and just float around reading. It was so fabulous. That was before THE BOOK. Our garden is still fabulous, and we walk through it and cut flowers almost every day... The dahlias are crazy wonderful now. We did grill out. Yay, us. We went to Tanglewood, and heard two gorgeous concerts from the BSO. Ah, we went outside to watch the meteor shower, but I saw only one shooting star. One good part was when I looked at my calendar wrong, and realized I had worried myself out of a whole week. When I got the week back, it was fabulous. Chill a short glass. 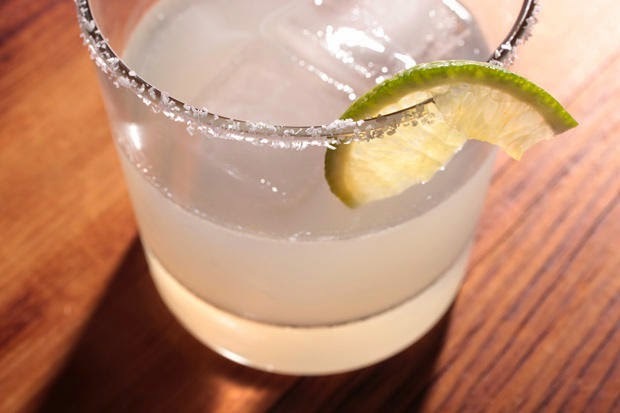 Rub the edge of the chilled glass with a cut lime, then dip the rim in fine kosher or sea salt. Fill with ice, add the other ingredients, garnish with a lime sliver, and enjoy! If you are making these in a batch, it's best to mix the ingredients in a pitcher, then fill the chilled and prepared glasses. And if you are making a batch, you may appreciate an electric juicer. It takes a lot of limes! Readers, what have you missed this summer? Can you get anything in this last official weekend? Deb, I just copied your dad's Margarita recipe into my drinks folder, and Steve and I will serve them at our 45th anniversary on September 3rd. Like everyone else, we've been busy with all the everyday things that seem to keep us doing anything except relaxing and enjoying the summer. We have enjoyed the fresh vegefables from the garden, grilling, and blueberry pot pie. But we haven't made it to the boardwalk . . . good to know there's still time to get in a wonderful stroll . . . .
New England has enjoyed a delightful summer, and up where we are we had plenty of regular soaking rains, too. I've had regular BLTs with huge garden tomatoes - yum - and a couple of delicious ice cream cones. And a few refreshing G&Ts. But I didn't get to the beach as often as I wanted because I was working every day, too, and had only one late day dinner picnic there. I'm not going to get to the beach this weekend, either, as I'm in Michigan visiting my Brazilian exchange student sister (from 1970) until tomorrow, and then I'll be driving 900-plus miles home - solo - from this Indiana research trip. Guess I'll look for those special margarita ingredients myself when I get home! Mmmm. That Margarita looks fabulous, Debs. Printing it now. Jealous of your tomatoes, Edith. Reine, congratulations! Like you, I found a good man and stuck with him. Last night we had the perfect summer dinner. Cold shrimp, lobster, and salmon with garlic mayonnaise; steamed pole beans, Jerusalem artichokes, and carrots with vinaigrette. And my garden's parsley and oregano sprinkled over all. Insistent on not allowing it to be completely gone just yet, we still have our beach trip to look forward to. A week in Topsail coming up in a few weeks. Oh, how I love the beach, but especially after the summer crowds have gone home, and the weather is a little cooler. Heaven. In the meantime, we have eaten a LOT of BLTs this summer. I never buy tomatoes at the grocery store. When our produce stands close down for the season, that means the end of BLTs and I will be a sad girl. It just dawned on me the other day that I had not worn my bathing suit all summer. Also, when I paid the electric bill yesterday I realized it was half what it was last year for the same time period. It's been a lovely, cool summer here, and we've barely needed the air conditioner for a change. However, I have had a great garden, for the most part, and we are getting slammed with tomatoes and green beans right now. It's late for the tomatoes because of having such cool nights most of the season, but they're making up for it now. And I really made the most of the wild blackberries this summer. Gosh, 45 years, Reine! Mazel tov to you and Steve. Summer? There was a summer? Summer never arrived up here on the tundra. Spring waltzed in with a new moon in her arms and took up residency through August so far, maybe into September. While I didn't go swimming, I've been to the beach, had cantaloupes, margueritas, grilled everything, and enjoyed the roses blooming again in August because WTH, it still feels like June. This is the most beautiful summer in memory, now made bittersweet by the untimely death of a dear young friend, just 2 days after her 51st birthday. If God really needed another angel, surely he could have satisfied himself with someone old and frail and ill. Call your friends and family this weekend, if you aren't seeing them. Tell them you love them. I can vouch for the perfection of Charlie's Perfect Margaritas, and am also very clear about the fact that Deb didn't make one for me on National Margarita Day. How did that happen? Eh, we were probably messing with dogs. I copied the recipe, too! We bought a new house the day after Memorial Day and we've spent all summer getting the new one ready for us to move into or the old house ready to sell Oh, and the moving stuff, too. The old house is not completely empty yet. Darn it! It's made for a crazy summer. At the same time as our house buying, my mother, already suffering with dementia, started wandering within and outside of her senior housing building. So my sisters and I (mostly them) had to do an emergency search for a bed in a secure dementia unit. She's a WWII Navy Nurse Corps veteran so we were able to get her into the Maine Veterans' Home and they have been a godsend! Like I said, summer has been crazy. For Ann in Rochester--highlight of my summer was visiting with a dear friend! So glad for the opportunity! When school starts, summer seems over, no matter the weather. What I missed? My once-a-year-treat of a banana split from an ice cream stand that's in the hands of the third generation now. Cheers to all of us--may we all squeeze in a few moments of summer bliss--mine usually involves reading in the swing. Looking back summer was pretty predictable when we were kids, wasn't it? The back yard renovation started the end of March and was to be done in June, just in time for lazy days in a comfy chair reading and sipping a cool drink enjoying my new status as a retiree. Latest estimate is now end of September, so hoping for a mild winter. Fun to watch it all take shape, though. I traveled to help care for a terminally ill aunt in July. Very sad, but to balance that I reconnected with wonderful cousins and now we are closer than ever, and also got to see my great-grandbabies again. And the best part of the summer was celebrating our 45th anniversary in June. So all in all a pretty good summer. I'm going to take a crack at Deb's dad's Margarita. I can attest to her mastery of all things alcoholic; we served her Christmas Cocktail (http://www.jungleredwriters.com/2012/12/debs-christmas-cocktail.html)two years ago at our big Christmas dinner and it was a huge success. Reine, congratulations to you and Steve!!! Sending big hugs your way. Enjoy the margaritas:-) They are fab. Gigi, and I will buy some limes today. I have the tequila and the Creole Shrubb:-) And yes, we were probably messing with dogs. I should maybe add that not only have I finished and edited a book this summer, and acquired (unexpectedly) a new puppy, but I've had a chance to spend lots of time with my daughter and son-in-law. They and their dogs stayed with us for six weeks. Now they are in their still-not-finished-with-renovation house, but the dogs stay with me five days a week. Hence lots of sitting on the deck and watching the dogs play! Sorry—Famous Harrington twitch messed up and deleted my comment. Let's see if I can get it right, this time. Thanks, everyone. Not sure what we're having for dinner that night. Something lobstery maybe. We haven't had lobster all summer. I had a wonderful summer. I went to a writer's conference where Rhys Bowen was on the faculty. It was my first writer's conference ever and I had a great time. I also took a one day photography workshop in Sonoma with national geographic photographers, which was fun! I was able to see dear friends during the summer. So I am happy about that. 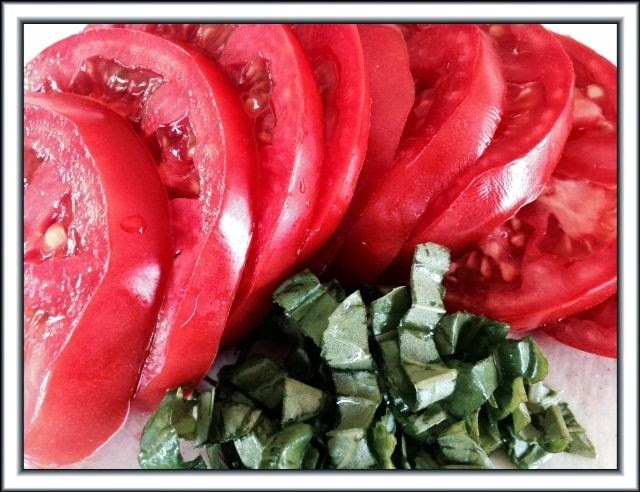 And one of my favorite things about the summer is finding dry farm tomatoes at the farmer's market. Despite the drought, my summer is going well. We get to play tourist in San Francisco, which is a skip and hop from home. We took the ferry from SF to Larkspur, from SF to Angel Island and to Sausalito. Thank you so much for the elegant Margarita recipe. We love them in Nevada. Our summer was blessed with what the Brits call brilliant weather. Warm and dry with no floods or storms or cold spells. That's the joy of the high desert.I miss my friends in New York and the food in San Francisco, but Reno has the best four season climate in America. Summer has truly been the blink of an eye, and I haven't had my granddaughters over as much as I wanted. They've been so busy and gone, too. But, I went to my youngest grandgirl's 5th birthday party today, and it was the perfect way to end the summer. Like you, Kaye, I have really enjoyed the BLTs this summer. We just had them again tonight. I buy my tomatoes from a local grower, too, and I learned a new, easier way to cook lots of bacon (in the oven), so it has been a yummy feast of BLT sandwiches. I've gotten a lot of reading done, so that makes for a fun use of time. It hasn't been a horribly hot summer here in Kentucky, but the last 10 days were in the 90s, so that heat is fresh in my memory. I'm going on a girls' trip to Key West in a couple of weeks, which I'm getting excited about that. Maybe I'll get to buy you a drink, Lucy. Congratulations Reine to you and your husband on 45 years. Wow! That's wonderful! Thanks, Debs, for the margarita recipe. I have a feeling that your dad's drink is going to find many new fans. I don't go to the pool nearly as much as I used to. I've got easy access in my pool complex, but it just doesn't seem to happen. Part of that is that with running and playing ultimate Frisbee several times a week, that's the time I used to spend in the pool. Some year, I'll figure out how to do both.